It's a very personalised layout, carefully designed to suit our lives. This is on our family farm, so building to suit, not to sell. I would make an en-suite to the master bedroom in both, e,g in the right hand barn, turn th bathroom into an en-suite leaving the shower room for general use. What is upstairs in the left hand barn? Thanks for your feedback, I know lots of people like ensuites, but we're not fans of them. They either seem to mean more spaces to clean, or people/kids traipsing thro the bedroom to get to use it. There aren't really upstairs spaces, mostly vaulted ceilings, with a couple of storage areas/lofts. At least in the right hand barn, the cleaning would be exactly the same, since you're just converting a bathroom to an ensuite. I also can't see why anyone would be walking through the bedroom to use that ensuite given there's a bathroom right next door. I've lived in something like 20 houses as an adult, in three different countries. Only two had ensuites, and I would never go back to not having one if I had the choice. I can't recall ever meeting anyone who wasn't a fan of ensuites, so I think the interest in them goes a little beyond "lots of people". You say you've designed this to suit your lifestyle, but there are two barns. Are the two families that are going to live in them both committed to not having ensuites? No offence, but being against ensuites is a pretty idiosyncratic position for most people. But hey, it's your money, and your house. Re: the right hand barn, the position of the island seems to introduce a large triangular dead area between it and the rest of the kitchen. For me, that would be impractical and feel strange. When we were laying out our kitchen, I knocked together some rough frames out of scrap timber and clad it with some leftover sheet plastic. It gave a great idea of what the actual space would feel like, and led to us to tweak the dimensions and position of the island to better use the space. Can you do something like that? I personally think you'd have more efficient use of space if you didn't have all the angles in the kitchen. Has an architect been involved with this? I know a lot of people don't want to pay for them ("I know what I want! "), but this seems like exactly the sort of project to which a good architect could add some serious value. By "value", I mean lifestyle quality rather than just making the final building worth more financially (although I suspect they'd achieve that too). It does look like an exciting project. Do you have any pics of the barn you'd be willing to share? The circulation route through both the barns is quite convoluted imo, the first one, you come into the utility with a wc on one side and a bathroom on the other, both accessed within a couple of meters of each other, then to get to the bedrooms you are having cutting through the main space so it limits the furniture placement. In the other side you have a lot of area given over to circulation but you have to walk through the main living space to get anywhere from the entrance. 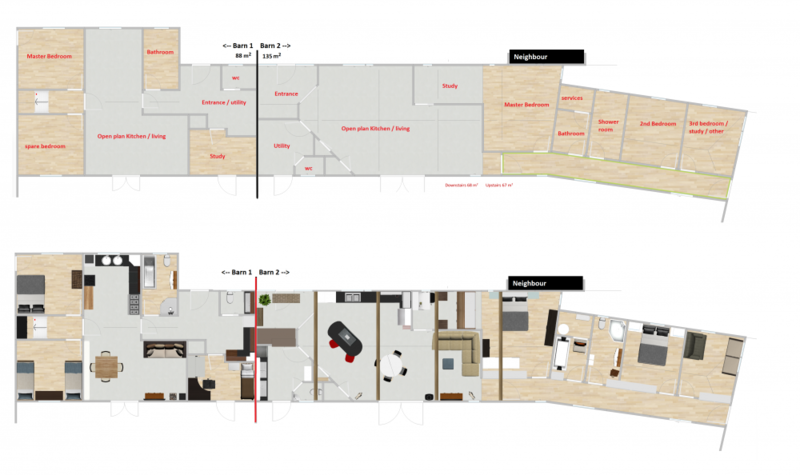 have you got a site plan at all? IANAA.... but with the barn on the left i think something that would really put me off is having to walk through the open plan living to go to the toilet / shower, could you swap the kitchen / bathroom space around, this would also mean that from the kitchen you would have a visual connection to the front of the house enterance. I'll conceded that rather than "a lot" it could well be "most" people who like ensuites. But you most certainly increase the things that need cleaning by having them. I only have 1 each (bath, shower, sink, toilet), with everyone having easy access. By turning either space into an ensuite would double all that. Regarding the kitchen island, I'll definitely be mocking up with cardboard before finalising the shape, could well be that a more triangular shape will work better. I like there to be space to cross paths with other people without having to turn sideways, including when the dishwasher is open. Layouts of the front doors was set by virtue if the pre-existing entrances to the barns, our 'permitted development' did cause some restrictions, but luckily nothing we weren't happy with. Barn 1 is where my mum will live. She wants to enter via utility room and have easy access to bathroom from there, all to do will her dogs. If that were my side it'd be different no doubt. She also knows exactly which furniture is going where, so no need for that flexibility. We did involve an architect to draw plans for us, we chose him based on his ability to cope with our strong ideas, he did suggest other ideas, but none really took account of how we live. I agree Moonshine, if I was living in barn 1 I'd swap the bathroom over with the kitchen, but my mother is adamant that's how she wants it. I hadn't picked up on that i was for your mother, sorry if this comes across bluntly (i don't know anything about her, her age, or health) but maybe there needs be some consideration of layout and access in the future (e.g. if mobility ever became an issue), such as the number of doors, and also drainage considerations for a level access shower. It's fine that your mum wants to enter via the utility, most houses I do have a mud room/utility in them too, but it isn't necessarily where you want everyone walking through - there is still the strange issue of having both a wc and a bathroom accessed so close to each other, from the same hall - If I was doing this for you, I would produce a 3d model of the building so you could have a walk through and really look at the layout. Is that a stair in between the two bedrooms? I wouldn't dare suggest any age-related adaptions to my mum, think I'd be disowned from the family! Tho a worthy conversation, it's just not somewhere we're going to go. She's been a farmer all her life (still is), very fit, and equally as opinionated as me! Yep, that's a staircase between the bedrooms in barn 1, tho this isn't fully decided, may end up as a loft hatch. I think that area is a real waste of space, but again, mum is adamant. The table is what we use now, very roomy for 4, a squeeze for 6, but we have had 7 round it. I love it, will be fine. The diagonal wall is to draw you into the room, also giving a good number of practical spaces for storage (that I feel so many houses lack). I know I'm completely weird, but I don't really see much point to giving good views to bedrooms. In fact I feel the view has then been 'stolen' from everyone else. Plus I hate dark corridors. +1 in not having ensuites. I know a lot of people love them but I'm with you on the cleaning, although I think they're just generally unnecessary and add additional cost where it isn't needed (for us). I suspect it's one of those things where once someone's experienced them they'll find it hard to go back, but I can't honestly remember thinking I've needed one (and that includes big shared houses). If an architect used that language, I'd be asking him or her to explain what it actually means. If you can't see from the plan how awkward that diagonal wall and island position are going to be in real life, then all I can suggest is that you get some cardboard and scraps of wood, and build the diagonal walls, island and cabinets (and perhaps even the furniture) in the existing space. I think you may be surprised at how much space is wasted, and how awkward it will feel when you're standing in it. From your responses so far, I doubt anything anyone's going to say will convince you otherwise, so perhaps this is the best way to convince yourself that you're right! also giving a good number of practical spaces for storage (that I feel so many houses lack). I personally don't think your storage spaces are particularly practical - they're too deep for shelves, and not deep enough to allow walk-in access. I don't see how a wall being diagonal makes any difference to storage space. I'm a natural contrarian myself, but unless you've actually lived in a house that has all of these unusual features, I think you're taking a massive risk. To me, both plans are lacking cohesiveness - neither feels like things are where they naturally should be. There are lots of random nooks and corners without any apparent reason for them. You say you like honesty, so here's my last bit of that: I suppose you didn't ask for feedback, but if you've lurked long enough, you'll know that posting a floorplan is going to get you a fair bit of it. Nothing anyone's said seems to have had the slightest impact at all. No need to post an answer, but you might ask yourself what you were hoping to achieve with posting this given that you and your mother appear to have finalised your positions already. I wouldn't dare suggest any age-related adaptions to my mum, think I'd be disowned from the family! Tho a worthy conversation, it's just not somewhere we're going to go. She's been a farmer all her life (still is), very fit, and equally﻿ as opinionated as me! ﻿ The diagonal wall is to draw you into the room, also giving a good number of practical spaces for storage (that I feel so many houses lack). I know I'm completely weird, but I don't really﻿ see much point to giving good views to bedrooms. In fact I feel the view has then been 'stolen' from everyone else. Plus I hate dark corridors. Corridors are spaces you pass through, bedrooms are spaces you spend time in - I can't think I've ever had a client saying that the dont want natural light in their bedrooms, in fact on a blank plot it's usually one of the determining factors of setting the house orientation! Understand about your mum, it's not about not giving her what she wants but doing something that is better for how she wants to live, we spend hours and hours with clients to get to what it actually is they want, rather than what we think they are asking for. Age related adaptions can make a place feel much nicer and generous with space if it's designed properly. I understand that it's what you use now but as I say, there is no adaptability, what if you end up wanting to put a bigger table in, or a square table, or you want to add an arm chair in rather than have everyone sit on the couch all the time. You also have everyone in the house having to walk between the tv and people every time they come and go to a room. What draws people into spaces is usually light or views or a glimpse through to something else rather than a jaunty wall angle - triangular storage areas aren't that practical imo, there are definitely ways to add more storage or incorporate clever bits into the plan. In response to Jack's last point, what am I hoping to achieve - just sharing and discussion. I know forums are great for asking advice etc, but they are also places people browse to see what others have done, and why. I'm happy to have my ideas challenged, I find that the best way to finalise decisions, by either being persuaded or cementing my thoughts. I wonder how many minutes other people spend (with they're eyes open) in a bedroom. I reckon for us it's sub 20mins a day. I think there'll be plenty of natural light from the large skylights, just not views. "If you﻿﻿﻿﻿ can't see from the plan how awkward that diagonal﻿﻿﻿ wall and island position are going to be in real life, then all I can suggest is that you get some cardboard and scraps of wood, and build the diagonal walls, island and cabinets (and perhaps even the furniture) in the existing space. I think you may be surprised at how much space is wasted, and how awkward it will feel when you're standing in it﻿﻿﻿﻿﻿﻿.﻿"
I'd be interested for you to expand on this please, I can fully imagine living in this space, I've been daydreaming about it for years now. In what way do you think it will be awkward? "n﻿ei﻿th﻿er﻿ ﻿﻿﻿feels like things are where they naturally should be." I find this a slightly odd comment, surely one of the many reasons people self-build is because conventional ideas of 'normal' don't suit them? "There﻿ are lots of random nooks and corners without any﻿﻿﻿﻿ apparent reason for them. " Please point them out, I'm pretty sure I can explain each and every one in barn 2. And that's exactly why I don't see much point in expanding further on what's really just my personal opinion. Also, several others (including an architect - @the_r_sole) have raised related questions about your choices and you've stood your ground on literally every point. Entirely your prerogative, naturally, but hopefully you can see why I might be reticent to spend much more time on this! I wonder﻿ how many minutes other people spend (with they're eyes open) in a bedroom. I reckon for us it's sub 20mins a day. I think there'll be plenty of natural light from the large skylights, just not views. I’m with you re the bedrooms TBH. I have space to sit in mine but never do, and nor is there a TV up there so I’m not particularly bothered about light or views. That said, when I view a house the master bedroom looking fabulous with space, light and views can create a wow factor 🙂. An en-suite is a must have for me. Love a bathroom that I can use without needing to exit the bedroom and is my own domain. My mother sounds a bit like yours. When my father needed mobility provision made she ripped it all out when he died ‘as she didn’t want or need it’. She wouldn’t have entertained a conversation about keeping it for the future but 15 years on she’s now having similar stuff put in again 🙄. When my husband was ill we were glad of the wet room we had put downstairs as it meant that he could remain independent. We hadn’t expected to need it for a person (it was mainly installed for the dogs lol) so you can never predict how things will work out. Jack, I seem to have annoyed you somehow, that was not my intention. I've tried to answer questions and explain as best I can. But I can't respond to statements I don't understand, eg 'awkward', when I don't see what you mean. I gather that you don't like my design, but don't wish to tell me why. We'll leave it there shall we. I absolutely understand why an ensuite would be nice, as you say newhome, I just don't value it highly enough to warrant the space required and extra cleaning generated! If course no one can know exactly where life will take them. I'm glad our barns are single storey as that gives flexibility of itself. And most of the internal walls aren't structural, so not out the question to rejig later if something unexpected happens. An en-suite does not increase the amount of cleaning. We use the en-suite instead of the family bathroom, so that needs cleaning less often. It's like the argument if you have more toilets you must use more water, No you don't you just use whichever toilet is most convenient at any particular time. We like to spend time in bed with a cup of tea in the morning, a good view with nobody overlooking us is important. If you don't like an en-suite how about a Jack & Jill? OK @Jenni, with barn 1, can you put the bathroom where you currently have the stairs and incorporate the current bathroom into the living space? If the stairs are just to loft space (as the height looks far too low for a second storey) you could just have a loft ladder. The main living space might be nice vaulted. I might look at barn 2 later. an ensuite would have bath, shower, sink, wc. A family bathroom would have the same, thus doubling the number of items that need cleaning. If as everyone says, the ensuite is just for use by occupants of the master bedroom, then all other people in the house use the family bathroom, then they both need cleaning. I'm struggling to 'defend' barn 1, as that has been decided by my mother. When I suggested similar to your thoughts (which I think works well), it was dismissed, she wants to be able to access the bathroom from the utility room, to clean dogs off before they hit the main room. 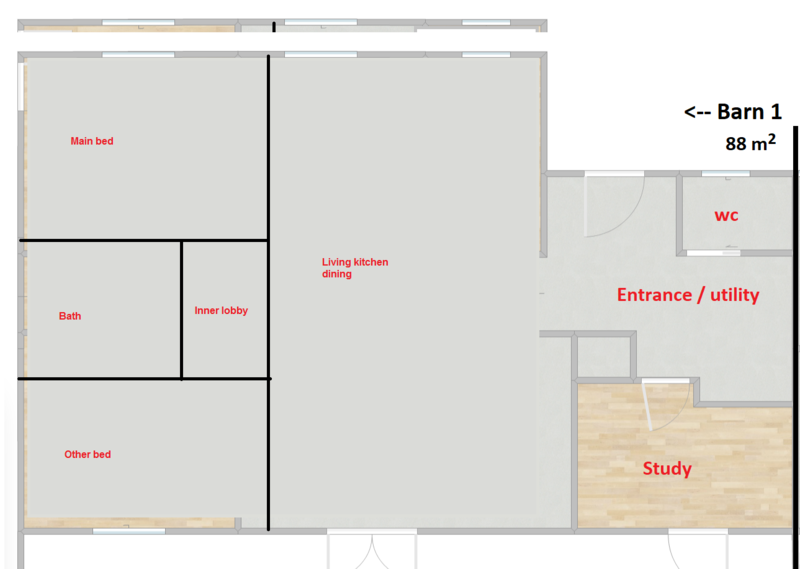 You're correct that area above bedrooms is just loft space, and main kitchen/living area will be vaulted. I feel much more comfortable with barn 2, which is where I'll be living. How about making the 'WC' a wet room with shower, but also with a high powered spray to hose down the hounds? I'm not annoyed - I'm just allocating my time as best I can on a crazy busy day. In all honesty (and in the nicest possible way) I genuinely had the feeling that nothing anyone says will change your mind, so there didn't seem to be much point arguing. My main concern about the island is less the diagonal wall per se, but more how you've aligned the island with it, and defined a large triangular area between the island and the corner of the kitchen up from the fridge. To my mind, that whole area consumes a lot more space than it contributes by way of function. By way of reference, we have 1.2m spacing between our island and the adjacent run of cupboards. That distance is more than enough for people to walk past unimpeded while the dishwasher is being unloaded. Any more and the island would start to feel disconnected to the rest of the kitchen. We figured out this spacing by building a rough version of the island as I explained above. In your case, I suspect the island is so far away that it will feel separate from the kitchen. All that said, I'm just some bloke arguing on the internet. If you rig up some walls and an island with cardboard or whatever you have to hand, there'll be no speculation. You'll either confirm that it's what you want, or you'll avoid a potentially costly error. Either way, it's a win. The comments about awkward spaces included some of the stuff mentioned by others (@the_r_sole in particular), but unfortunately I need to get back to work so can't expand any more at the moment. that would be a good idea Moonshine, but apparently not what she wants. For the record - I plan on fitting an outside mixer-tap to hose my mutts off before they even get near inside! I'll definitely do as you say and mock up the walls, units and island to make sure it functions as I hope. Yes, but each gets used less so do not need cleaning as often.